Hamburg Maritime Foundation (German: Stiftung Hamburg Maritim) was established in 2001 by a local bank, initiated before by Hamburg Chamber of Commerce. The only purpose is to preserve and restore the maritime heritage of the city of Hamburg and to make it accessible to the public audience. The foundation therefore is aided by Hamburg’s city government. Description of flag: The ratio is 3:5. The flag is divided by saltire into red(top, bottom) and blue(hoist, fly). In the top quarter is the castle superimposing a completely blue anchor similar to the image of the admiralty flag. In the other quarters are white, serifed capitals “S”(hoist), “H”(fly) and “M”(bottom). The flag has a narrow white bordure. I spotted this flag on 12 September 2008 hoisted at the restored racing yacht ARTEMIS. 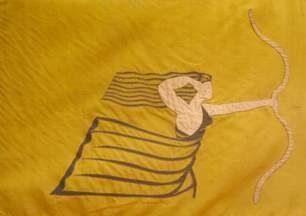 Stern flag of yacht Artemis: It is a golden flag with an image of Greek Goddess of hunting (German: Jagd ~=Jacht = hunt) in its centre, shooting her bow. Source: I spotted this flag on 12 September 2008 hoisted at the restored racing yacht ARTEMIS.